Mission Bulldog Stuart Grant looks for an open pass in a game earlier this season. 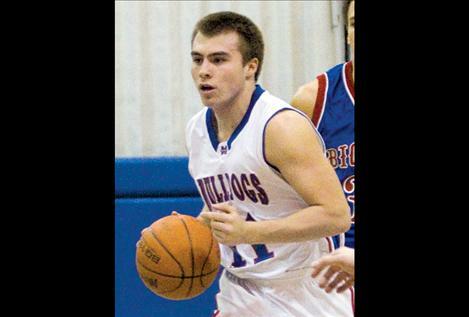 HAMILTON — The Mission Bulldogs and Lady Bulldogs are headed to the Western B Divisional basketball tournament beginning Thursday in Kalispell after both teams took fourth place at the District 6-B tourney last weekend in Hamilton. The Lady Bulldogs beat Ronan in a play-in game Feb. 12, 47-32, and moved on to play Deer Lodge in the semifinal round Friday, losing that contest 54-25. Next up was the consolation round on Saturday, where Mission lost a close contest to Florence, 49-44. Deer Lodge won the girls’ tournament. Mission’s boys also faced Ronan in a play-in game Feb. 12, winning 57-51. On Friday, the Bulldogs lost 63-34 to Florence in the semifinal round, moving on to play Deer Lodge in a consolation game. Mission lost that round 73-46. FLORENCE – Courtney Byrne 7, Hailey Huot 1, Courtney Austin 5, Carli O’Brien 1, Megan Byrne 8, Cass Skeers 11, Paige Bodner 4, Cody Miller 5, Kyndall Hoff 6. ST. IGNATIUS – Loren Erickson , Emilie Charlo 6, Stephanie Lewandowski 23, Haley O’Hern 10, Courtney Charlo 3. DEER LODGE – Derek Walker 13, Jesse Vasquez 13, Rodney Hunter 10, Andrew Pierson 4, Jake Simpson 23, Kota Crowe 6, Ethan Johnston 4. ST. IGNATIUS – Jarred Brown 16, Paden Alexander 2, Dylan Evans 13, Stuart Grant 12, Nikko Alexander 4, Will Powell 4, Nick Durglo 3, Patrick Eichert 2.